There are reasons why it took this long for a new nail art design. A hectic work schedule is my primary excuse. But the real culprit is lack of inspiration. For more than a week, ideas for a nail design comes but never stays. So last night, I was trying to sleep early because I needed to wake up early the next morning. But I wasn't sleepy. What do you do when you want to get sleepy? As for me, I often play a game on my mobile phone or watch a movie until I fall asleep. 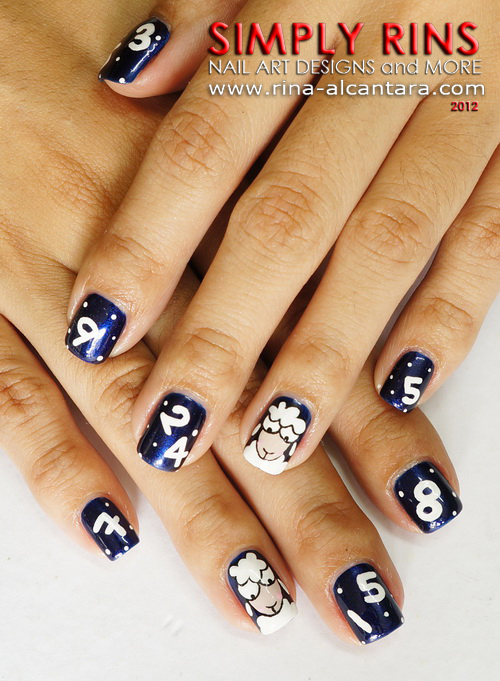 But before I even started to play, I had an inspiration for a nail art -- counting sheep! I don't really do that to fall asleep but I thought it was funny I thought about it just when I wanted to sleep. Creating this nail art design is somewhat ironic. I wanted to fall asleep and I ended staying up late because I got excited to do this Sheep nail art. Initially, I wanted to paint 10 sheep but since I still need to wake up early, I decided to do accent nails instead. Nevertheless, I think this turned out well and I still smile whenever I look down on my nails as I remember how this design came to be. There was no deliberation on what color I wanted as base for my Sheep nail art. I wanted a dark blue color that would mimic the color of the night. So I searched my stash and decided on Misa A Sin Worth Committing and I just loved it. This is 2 coats and there's no problem with the application. It has a glossy finish even without a top coat. I hand painted the nail design using acrylic paints. I painted a sheep on each hand on my ring finger and painted numbers in random order on my other nails. Perhaps I could try to stare on my nails tonight and see if it could help me fall asleep. But I feel I would be smiling instead. I found it amusing what prompted me to create this Sheep nail art design. Do you count sheep when you want to fall asleep? P.S. Did you know that sheep is singular and plural at the same time? Those sheep are so cute. I really like them against the dark blue, too. You're so creative! This is adorable. The color you used for the base is beyond perfect. And I never really realized the word sheep was singular and plural...weird. These are adorable!!! 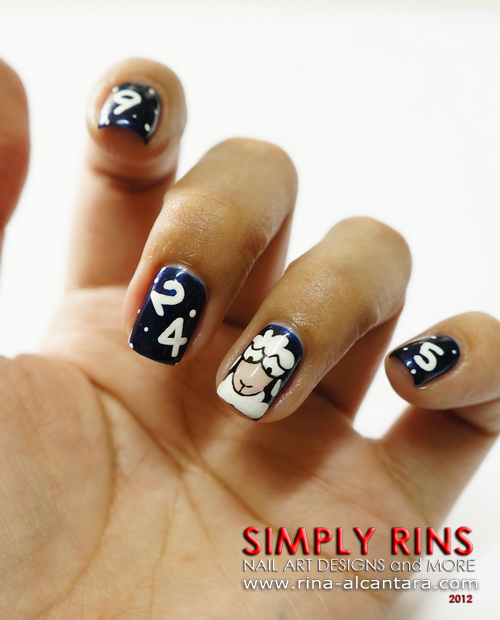 I would have never thought of doing a counting sheep nail design but now I think I might try it because it is so cute!!! And how do you get the numbers on there? They look so perfect so I was wondering if you used a stencil or something or if you are just really superly talented. P.S. Could you maybe think about doing a Winnie the Pooh design? Hahah these are SO cute!! I love the little sheep! I always get lots of great ideas for nail art when I'm lying in bed trying to sleep. I keep my phone by my bed and make a note of any ideas I get! LOL I design rubber stamping projects or (more recently) nail art ideas while waiting for the sand man to visit. Whatever works, ya' know? Absolutely spot on with this design once again!!!! Love the choice of colors and the end result. Maybe in a few years time mine will look a little bit like yours????? Ha...dream on, I just tried the heart patches and it was.....an abject fail. I'll keep trying though, my left hand was ok, but my right..I'm still laughing at the shapes that was supposed to be hearts. In the mean time, I'll just ogle yours Rina!!! Thanks, I love the base color too! I can't believe it took me this long to use it. It has been on my helmer for ages! I also just found out about the plural equivalent of the word sheep when I was writing the post. Thank you! I guess it is really true that inspiration comes from everywhere! so adorable, I love sheep in any form & this is just such a brilliant idea. I don't think you could possibly ever run out of ideas, even as you are saying you don't feel inspired, you go ahead & make yet another fantastically original piece of art that I could only dream of coming up with. You truly have a mind filled with art & a heart good enough to share. Banks and other vast monetary establishments normally have an advance endorsement process that makes it extremely hard to access cash. They want to loan cash just to those with high FICO scores and once in a while loan unsecured assets that are not upheld by a substantial resource or some type of huge security.Banks and other vast monetary establishments normally have an advance endorsement process that makes it extremely hard to access cash. They want to loan cash just to those with high FICO scores and once in a while loan unsecured assets that are not upheld by a substantial resource or some type of huge security.